It is a closed world - but not detached. It feeds on our world, through me. It is made up of memories, associations… It has its own rules and its own logic… If I had not accepted these rules - I would not have painted." He further stressed: "The world is made up of countless little tragic-comical plays and we all play a part in it. The actors are not always to my liking, so I created a world similar to ours." Over the years, Kor addressed world affairs in his paintings: the Holocaust, the war in Bosnia, the Gulf War, the release of Nelson Mandela and other events. In 1995 he concentrated on the monotype technique and created a Danse Macabre piece pursuant to the murder of the Israeli Prime Minister. Paul Kor passed away in 2001. While battling cancer, he managed to present an exhibition titled "Almost Black", which consisted entirely of monotype prints. Paul Kor's paintings constitute an artistic and personal document. In 1976, he turned his back on his professional career as a graphic designer and devoted himself to artistic creation. Equipped with immaculate technical skills, he embarked on an adventurous journey down memory lane. His figures are eye-catching clowns and entertainers. A careful view reflects silence, as most of the figures do not have ears. He paints a mute street theater. His actors do not hear the music of the violin or flute. Their eyes are open wide but cannot see. The drama intensifies as the depiction is intensely colorful. Professor Alec Mishory used the Renaissance term "Silent Poetry" to describe Paul Kor's paintings: "The figures are dancing to the tune of silent music, dancing to the tune of mute music." 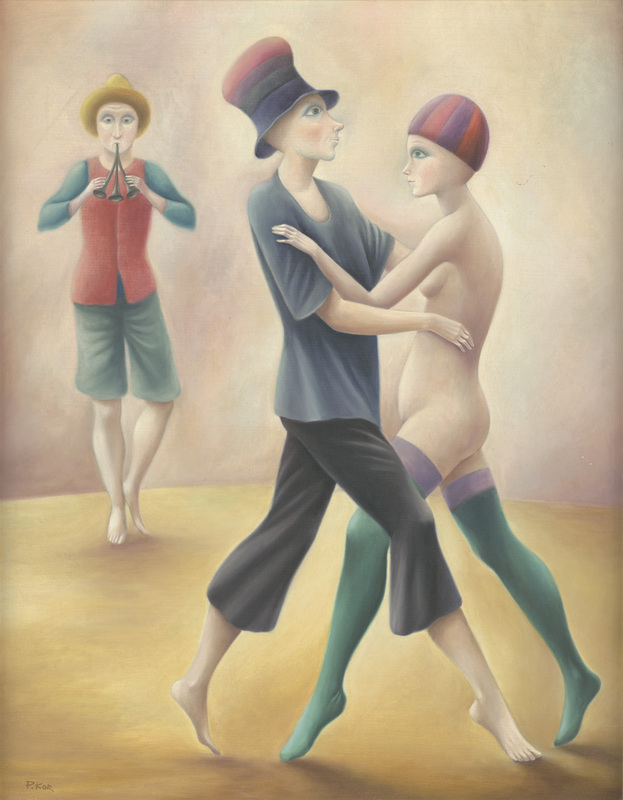 Paul Kor drew the inspiration for his figures from the mime theater of Marcel Marceau, and this is what he had to say about it: "I created a world of my own, similar to ours but different.